The top photo was taken in March before work began on the Gold Line bridge over the eastbound lanes of the 210 freeway. The bottom photo was taken yesterday — Wednesday, Aug. 3. As construction continues in the coming weeks, the wall will be completed, and then work will begin on the 110 foot deep foundations. That will be the first time a late night full closure of the eastbound lanes will be needed. We will provide advanced notice of those activities. 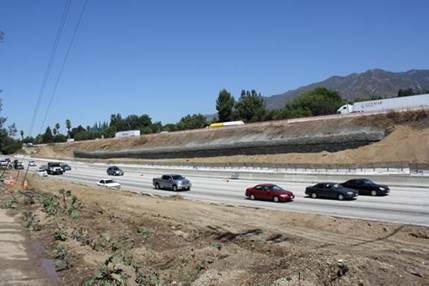 The Gold Line Foothill Extension will extend the Gold Line from Pasadena for 11.5 miles to the Azusa/Glendora border. 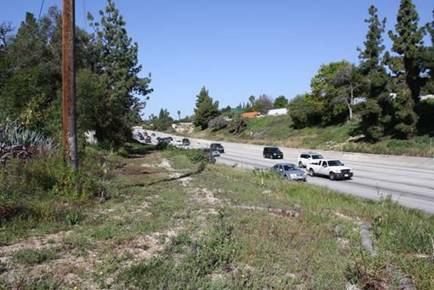 The project is being funded by Measure R, the sales tax increase approved by L.A. County voters in 2008 and is scheduled for completion in 2015.